Broadcasting companies pay considerable attention to protect their content because nobody wants to loose profit. One of the most urgent problems in internet streaming is blocking the ability to download media files. If media file is streamed via Progressive download protocol then this file can be easily downloaded. 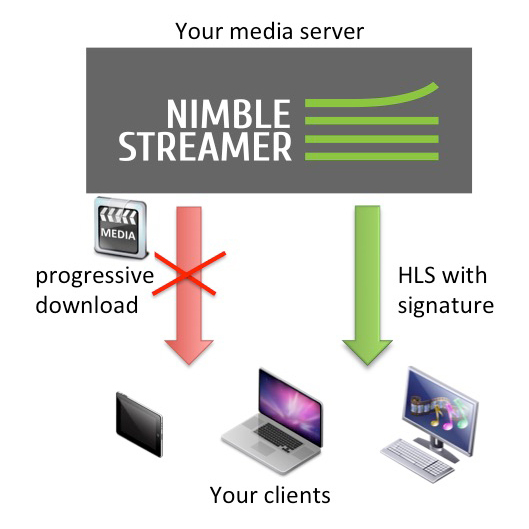 To restrict the ability to download media files by most of your users you can use more complex streaming protocols such as HLS or MPEG-DASH. Progressive download streaming should be blocked. You need to set up a rule in WMSPanel to protect your media files from downloading. First you need to create a rule that deny Progressive download streaming. We assume that you already have a preconfigured media server that performs Progressive download and HLS streaming. You need to add your media server in WMSAuth group to set up a rule. Log in to WMSPanel, go to "Control" -> "WMSAuth paywall setup". Press the "ADD WMSAUTH GROUP" link in the upper-right corner of the dialog. Specify the group name (e.g. PD_restriction) and give a short description for it in the proper fields. 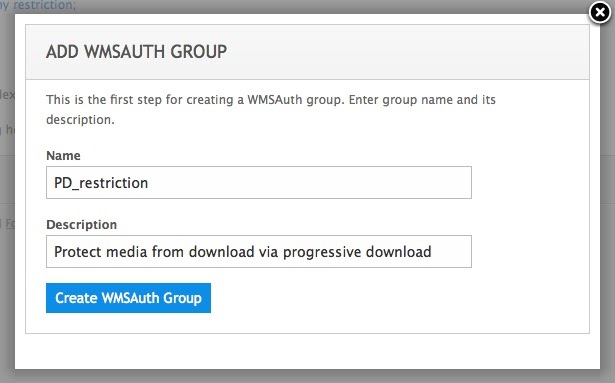 Then press the "Create WMSAuth Group" button. 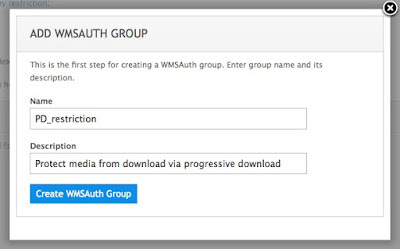 The new dialog which allows to assign one or more media servers should appear in just created WMSAuth group. Select the media server from drop-down list and press "Assign" button. You should see the message that server is already assigned. If you want to assign more media servers to this WMSAuth group just repeat the steps above. You can start to create rule that helps to avoid simple media file downloading after assigning media servers to your WMSAuth group. Press the "ADD RULE" link in the bottom right corner of the page. The rule creation dialog should appear. Give a name for your rule (for example "Protect progressive download by password"). The detailed information about these settings can be found in "Restriction solution for geo, IP range and connections" article. You can specify vHost, application or stream fields using POSIX regular expressions. In this case we are going to apply this rule to all possible links, so we leave all the above fields empty. Password - a secret key that would be known for both web server and media server. Protocols - which of media server supported protocols is this rule applied. You may want to protect particular protocol while other protocols might have another protection scheme. Just specify a strong enough password and check the Progressive download checkbox (leave all other protocols unchecked). To save the rule press the "Create WMSAuth rule" button. Now we have created the rule that blocks downloading media files via Progressive download.